Dat MF Steve! 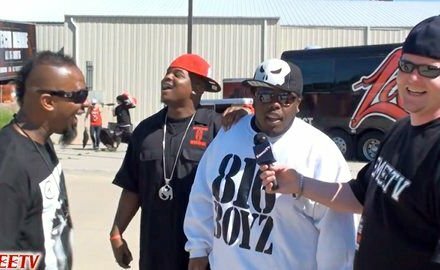 from EmceeTV caught up with the Strange Crew in Des Moines, Iowa to discuss the buzz surrounding the Hostile Takeover 2012 Tour, and what starts out as a typical interview quickly turns into Kaliko’s personal standup routine. Apparently, every stage name on the Strange Music roster can be attributed to Krizz’s genius with Tech N9ne originally being called just N9ne, Slice receiving an upgrade to Kutt Calhoun, and apparently ¡MAYDAY! also needed some help with their stage name because they used to be, uh…¡HELP! Peep this interview and then find out how Krizz Kaliko is the true Genius behind Strange Music and all of its great ideas. Click HERE To Get Your Hostile Takeover 2012 Tour Tickets!